"The people who put this together are AMAZING!" "The cruise is the best of both worlds!! Love it! Entertainment was super. Very likely to go again in the future." "The food at the Festival at Sea was very good. It is good to have a private room for our use and music/entertainment. The price is very good." "Enjoyed the Super Bowl together"
Wishing you a good year. George and I started going on the OPA cruise a few years ago and have loved every one of them. Our first OPA cruise was at the urging of my father-in-law Stamatios, who had been telling us for years what a fabulous time he was having. A little apprehensive at first, George and I decided to give it a try and now we know this is our annual, winter get away trip. Relaxing poolside during the day and the various excursions can be found on any cruise, but it’s the Greek theme that keeps us coming back to the OPA cruise. The live Greek music, the comedy that only Greeks (or those married to Greeks) can understand, and the friends we have met are what keep us coming back year after year. I can’t think of a better way to spend the week and I think once you give it a try you will agree. Hope to see you on the dance floor in 2017 !!! If you want to see smiling faces on happy people. Join us on this great cruise aboard Royal Caribbean's "Navigator of the Seas". The variety of great food, even some greek style, bingo with cute prizes, cocktail parties with dancing music and flowing cocktails kept us enjoying ourselves. Bet you never saw a cake designed as a Greek flag, as big as a table and delicious too. We did, at one of the private parties. Come join us if you like having good times with great folks!! Jane and I are looking forward to our 5th OPA Cruise. I knew from the first OPA cruise that this will definately be our annual February cruise. Meeting wonderful people from across America and enjoying the Greek musical groups for dancing makes our culture the best. If you enjoy cruising, adventure, good food, sunshine , ship shows & programs and Greek dancing, then try the OPA Cruise, it's the best! My husband Byron and I LOVE the Opa cruises and look forward to them every year! We have taken at least 3. We especially like "Greek day" on the pool deck. Lots of good Greek food, dancing and laughter. We like the fact you can join in, or just sit back, relax and enjoy! The several OPA CRUISES, that I have had the pleasure of attending with my late wife Victoria and of late, with my lady friend Jessica, have been remarkably enjoyable. Well planned by TRAVEL GROUP INTERNATIONAL ( Boca Raton, Florida ) in conjunction with the wonderful community of people from Ocala, Florida, this opportunity to cruise with fun-loving Greek people is in and of itself an entertainment experience that I anticipate doing annually. If you want a memorable cruise that satisfies your personal interests of fine varieties of food ; qualitative shipboard service for all of your basic needs and interests; nightly and most wonderful evening ship shows of amazing performers gifted with talents likened to that of the entertainment presentations of “ NEW YORK BROADWAY “ ; then you really want to be a part of the OPA CRUISE happenings. Shipboard fun and games along with various physical daytime venues of interest to satisfy everyone’s quest for time well spent on ship. Travel times off ship on the variety of islands scheduled for visitation offer considerable times to do numerous adventurous challenges and to visit places for the sheer enjoyment of seeing them as a tourist. In my opinion, the OPA CRUISES annually offer so very much entertainment for reasonable pricing compared to similar types of Greek Cruises that really offer so very much less for much more monies. If you have always dreamed of taking a holiday in Greece, but could not afford the travel time and expenses, then the "OPA" Cruise is the next best thing. You can't beat the value for the money. I enjoyed meeting people from all over the United States and sharing the cultural experience as we traveled, ate, and danced together for seven magical, fun-filled days. In addition to the ship's activities, the special entertainment reserved for "OPA" passengers was fantastic. The private entertainment included music from "The Aegean Duo" and "A Night in Athens Trio". Additionally, the world renown comedian, Basile, entertained us with endless laughter with reminders of growing up in America with our Greek roots. If you are considering a cruise, I highly recommend the "OPA" Cruise. It is one thing to recite this passage while preparing bread and wine for the Divine Liturgy standing on the firm ground of a church sanctuary. It is a different experience altogether to pray this Psalm while preparing bread and wine for a Liturgy on the stern of a cruise ship overlooking the dazzling Caribbean sea. But I am getting ahead of myself. It all started a year ago when, with the blessing of Metropolitan ALEXIOS, Pres. Rozanne and I were invited to be “Chaplains” on the annual Opa! Cruise. Parishioners from St. Mark Greek Orthodox Church, in Belleview, Florida (serving the greater Ocala area) had dreamed up this cruise as a way for Orthodox Christians to enjoy fellowship, raise funds for a good cause, and have fun. Although I love fishing and playing in the water, cruises had never interested me. I equated “cruising” with lavish excess and self-indulgent luxury. When I found out my wife, Pres. Rozanne, would be unable to get time off work to accompany me, it was an easy decision. There was no way I would even consider going on a cruise alone. Just when I was ready to give my polite regrets, my wife commented, “You know, your mother has always dreamed of going on a cruise.” Actually, I had no idea, but at Pres. Rozanne’s urging, I delayed turning down the invitation, and decided to float the idea with my mom. My mother, in her younger years, had been a well known speaker and world-traveler in the Protestant church, serving for many years in mission administration with my father. Normally, she would have jumped at an opportunity like this. But she had been ill in recent years and had let her passport expire. I really didn’t know if she would be up to the experience. But when I called her, Mom was enthusiastic. My wife had been right—going on a cruise would fulfill Mom’s life-long dream. So I decided to dive in! From the time we boarded the ship until we walked off the gangplank for the last time, every day exceeded my expectations. Yes, the food was wonderful. Yes, the personal service on board was excellent, and the amenities luxurious. Yes, waking up at a different port was an exciting adventure. Yet those were not the things that got me hooked on the Opa! Cruise. · getting to share—with a captive audience!—what God is doing in Guatemala and Mexico through Orthodox missionaries. I have been asked to serve as Priest and Chaplain again in 2014 and this time, Pres. Rozanne will get to come with me! Our new missionary assignment has us living and working in a remote mountain village in Guatemala among an indigenous people group who are among the tens of thousands of Central Americans “coming home” to the Orthodox Church. We look forward to telling stories, sharing music, and showing pictures to “take you there” during lecture sessions on board. We can’t wait to hang out with “old friends” again, and to meet all the new ones. See you aboard, God willing! I’ve been on many cruises with my husband and family, but have never enjoyed one more than our OPA! Cruises. After my husband died, I was asked several times by women friends to go on cruises. I declined because I knew I would feel uncomfortable in such a couple-oriented atmosphere. But when I saw the advertisement in the Orthodox Observer for the 2010 Caribbean OPA! 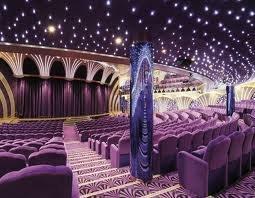 Cruise, I told my friends I knew this was the one for us. I can’t say enough good things about this well-planned, filled-with-fun Cruise. We not only have all the amenities that the ship provides, but also such extras as Sunday and daily Orthodox services with an Orthodox priest on board, a lecture on some aspect of Greek history or culture every day, Greek dancing lessons, special evening parties after the ship’s evening shows. And if you don’t have ID to prove you’re a member of the OPA! Cruise, you can’t attend any of these events. Also, there is a luncheon one day featuring Greek food that is available to everyone on board, and we get to show off our finest Greek dancing to the whole ship, who by now are really upset that they didn’t know about our special OPA! Cruise. 2011 Cruise a Thrill! Book now for 2012! 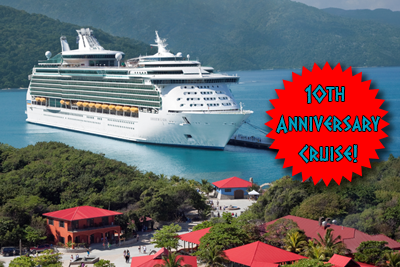 The 2011 cruise was a smashing success! Join us for the 2012 OPA! Greek Cultural Cruise on February 11, 2012. Call TravelGroup International to book now! 2010 Cruise Fun For All! Our 2010 OPA! Greek Cultural Cruise was a smashing success! A good time was had by all and we had many returning guests! Bookings for the 5th Annual OPA! 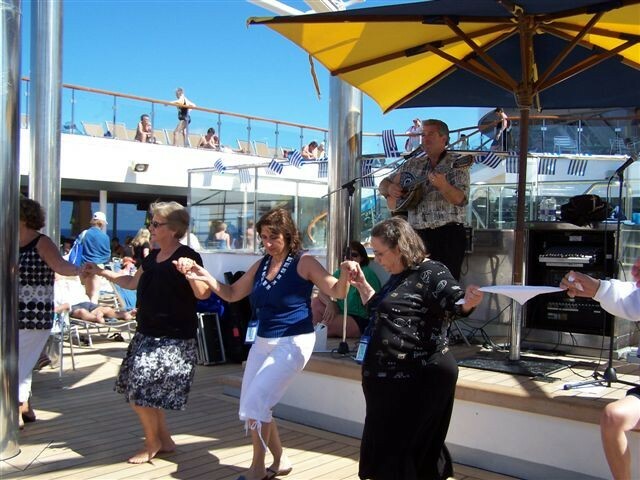 Greek Cultural Cruise in 2011 began onboard and continue. Contact TravelGroup International now to reserve your cabin! Our 2009 OPA! Greek Cultural Cruise was a great success! Bookings for the 4th Annual OPA! Greek Cultural Cruise have already begun. Contact TravelGroup International now to reserve your spot!